Ganesh Himal Trek is one of the popular trekking trails in Nepal. 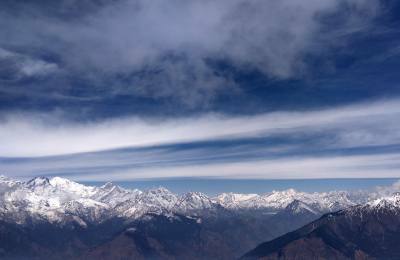 This Himalaya is located between the Langtang and Annapurna Himalaya region. The eastern part of the Ganesh Himal range is famous for the unique culture of the ethnic group called ‘Tamang’, and for spectacular views of mountains and colorful rhododendron forests. It is one of the most loved and most demanded trekking trails among the clients of Himalayan Joy Adventure Pvt. Ltd. The trekking to this area is often arranged for providing sight-seeing of the flora and faunas and the snow-capped mountains and the natural landscapes so as for the cultural tour, where you also can enjoy with diverse family of orchids and a variety of ferns, the valleys set ablaze by yellow blossoms of double Jasmine, the forest dense with Spanish oak, blue pine. During the spring season, the rhododendron bloom in such a way that really enchants one to visit time and again. Ganesh Himal trek begins from Trishuli or Syabrubesi and ends at Dhading or Gorkha, your trek through Ganesh Himal passes through yet unexplored valleys, pine forests and a number of passes. Furthermore, the main attraction area, the ‘Tamang villages and you reach Sangjung Kharka and Khola Kharka to view Ganesh Himal V, Ganesh Himal II, Langtang Li Rung (7,225m/23704ft.) and Paldor peak among others. This trekking offers really a superb opportunity to enjoy magnificent views of a number of Himalayas and explore the flora, fauna, and Nepalese cultural tradition from the closest quarter and intermingle with local people. You also can have panoramic views of more than 35 mountains including Singala pass, Dharka, Jasail Kunda, Jyamrung, Kasigaun, Khanchok, and Gorkha. This trekking is ideal for those who want to observe yet unspoiled Tamang culture, spectacular views of mountains and colorful rhododendron forest and making an excursion to the area, the trekking ends at Trishuli and then you will return back to Kathmandu.